Reinforce your classroom knowledge and learn to perform clinical procedures with ease and accuracy. 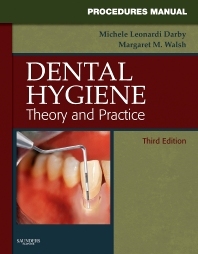 The Procedures Manual to Accompany Dental Hygiene: Theory and Practice contains step-by-step descriptions with information about the materials and equipment necessary to carry out the procedures. Rationales are included to ensure that you comprehend the science behind each step of the procedure. The manual also includes client education handouts and helpful tables and lists covering assessment, evaluation, and general client care. You'll want to keep this book by your side as a quick reference in clinics and as a refresher once you start your practice. Procedures include simple, clear illustrations and rationales for each step. Client education handouts and physical assessment and communication tips provide targeted resources for your role in the prevention of oral diseases. The easy-to-use format makes it a handy and highly portable reference.